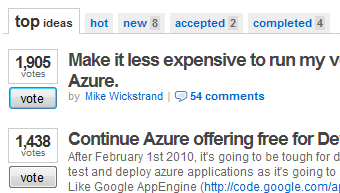 There a great site for seeing what developer and architects are asking for from Windows Azure. You can even throw your own voice into the conversation. You get 10 votes to throw into the mix. Click Here to vote or see the features for Windows Azure that are in high demand.